Get your green smoothies ready! Because between now and Christmas I have pretty much all sweet treats coming your way. It’s a sugar bonanza! With the exception of one savory recipe. Which is more of a holiday appetizer so that doesn’t really count as healthy sustenance. – Breakfast. Drink coffee and pound a green smoothie or oatmeal. – Lunch. Dinner leftovers. Always. – Dinner. 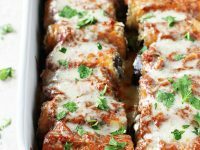 Make something healthy in an attempt to counteract all the holiday recipe testing. – Dessert. Pick from one of four sweet treats I currently have sitting on my counter. – After dessert. 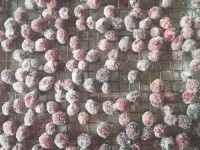 Test more recipes and add to that pile of sweets currently hanging out in my kitchen. Can you see my need for green smoothies?? It’s a vicious cycle I tell you. Although such fun so no complaining here. So. 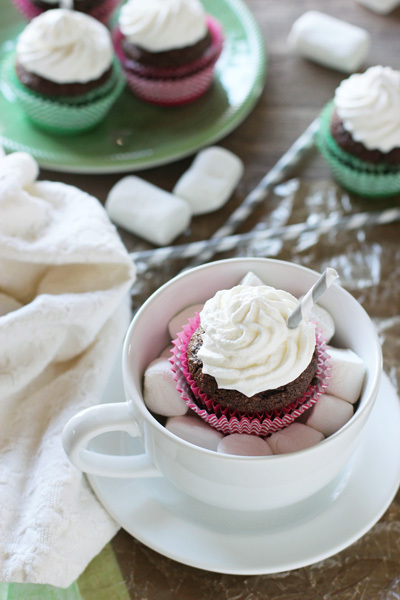 We’re going to ease on in to the sugary goodness with these hot chocolate cupcakes. Because while not exactly health food, they are certainly not quite as decadent as all my heaps of brown sugar and loads of butter recipes (coming atcha’ shortly). We have a cupcake base that is sweetened only with honey. We have coconut oil instead of butter. And! They are gluten-free. This was one of my many attempts to create a dessert that my mom and sister can eat. And unlike most of them, it actually turned out successful! Raise the roof! And by successful, I mean I actually liked them too (what can I say, I love me some gluten and normally don’t love the texture of gluten-free goodies?). Anywho, the base here is plenty chocolaty and has a hint of warmth from ground cinnamon. And the frosting is a simple stabilized whipped cream, so it holds its shape nicely if you decide to pipe it onto the base. Straws and/or marshmallows are optional, but I mean, just so fun. 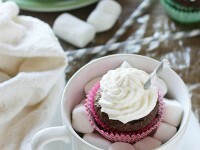 Hot chocolate in a lightly sweet cupcake form? Hard to resist friends, hard to resist. Recipe for hot chocolate almond flour cupcakes. Gluten-free, lightly sweet cupcakes! With a chocolate base and whipped cream frosting! Preheat the oven to 325ºF. Line a 12 cup muffin pan with baking cups and set aside. In a large bowl, whisk together the almond flour, cocoa powder, baking soda, salt and cinnamon. Set aside. In a medium bowl, whisk together the melted coconut oil, honey, eggs, vanilla extract and almond extract until combined. Add the wet ingredients to the bowl with the dry ingredients and mix until combined. Scoop the batter evenly into the prepared cupcake tins. Bake for 22 to 25 minutes, until a toothpick inserted into the middle comes out clean. Let the cupcakes cool in the pan for about 5 minutes, then remove to a wire rack to cool completely before frosting. Add the heavy cream, confectioners’ sugar and vanilla to a large bowl. Whip with a hand mixer until stiff peaks form. Transfer the bowl to the refrigerator and let chill for about 20 minutes. Frost the cupcakes as desired (using a piping bag or just spread it on). Once frosted, these cupcakes must be stored in the refrigerator, due to the whipped cream topping. Right before serving, top each cupcake with a few marshmallows (depending on the size) and / or garnish with a paper straw (this step is completely optional, but I thought just too fun!). *Be sure to melt the coconut oil first and then measure out the correct amount. Otherwise you may use too much! You may have some whipped cream leftover depending on how much you frost with – but I am of the belief that homemade leftover whipped cream is always a good thing! Just keep in the fridge in a container and you can use in actual hot chocolate! Or for eating spoonfuls… You could also just cut back the amounts a little if you know you aren’t going to pipe a lot on each cupcake. Frosting and concept from Cook Nourish Bliss. Cupcake base adapted from my almond flour cupcakes, which were originally from Edible Perspective. Love the idea behind these cupcakes – and they are SO cute in the cups!! I am totally with you and the need for green smoothies right after – peppermint bark for e.g. is starting to become a regular meal. I’ll chalk it up to us having an abundant amount of Christmas spirit! I haven’t experimented a lot with gluten free baking, like you said a lot of the time the texture is kinda funny but I am always willing to try it again, I know my friend who has an intolerance will enjoy these. These are so beautiful, and I’ve been having such a craving for a bangin’ cupcake lately! Hot chocolate in cupcake form? Oh myyyyyyyy! They look so cosy tooooo! I can imagine myself eating these tucked up in a blanket while its snowing outside, reading a book! So damned cute! These cupcakes look so pretty and tasty!!! 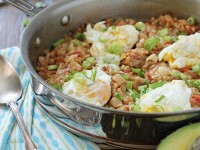 And love that this is gluten-free and healthy! I’m totally with you… please bring on the sweets! Pinned! Mmmm. I think I would definitely rather eat hot chocolate if this is what it is like! I had loads of hot chocolate this weekend and it sure got me craving hot chocolate flavoured desserts. I’d definitely like one of these cupcakes right about now. And I’m totally the same with the green smoothies…I feel like they’re the best way to get in a good amount of fruits and veggies when you’re overloading on the treats! 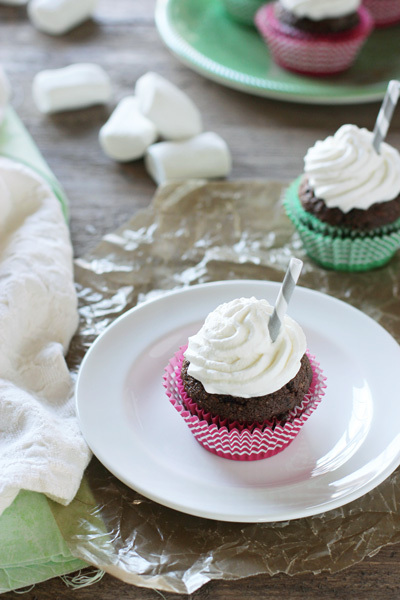 Hot Chocolate in cupcake form?!?! Heck to the yes! And love that this is gluten-free! Such a great idea… and I’m totally with ya… bring on the sweets! These are just darling! I love how you set your photos up! It makes these look irresistibly cozy! YUM! These look amazing!! …and please! Bring on the sweets!! 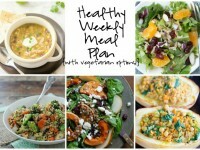 I LOVE your approach to enjoying them… your meal plans looks moderate and amazing!! Great job girl! Excited to see what recipes you have next! I have my green smoothie in one hand and my cupcake in the other. It’s all about balance 🙂 These look amazing. I love the way you styled these photos. Just gorgeous! Pinned. Oh my gosh! These cupcakes are SO fun and so pretty, Ashley! 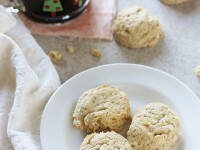 I love that they’re made with almond flour! These cupcakes are so so pretty! The hot chocolate and whipped cream frosting sound perfect! I love that you made them healthier and gluten free too! They’re perfect for balancing out all the other heavier sweets this time of year. Your mom and sister will be so excited! Thanks Kelly! I’m excited to make them again for them at Christmas! How cute as these cupcakes! They look incredibly delicious.. and I am just loving all that creamy frosting ontop. Saved the recipe to make, thanks Ashley for sharing it! I love these! Breakfast has been the one solid healthy meal I’ve been eating lately with all of the holiday festivities. Of course I’m not complaining, but it’s nice to have healthier sweet treats as an option this time of year, too. Such cute decorations!! Love these healthified cupcakes! They are definitely right up there with a big mug of hot chocolate, and I love that fluffy cloud of whipped cream on top — that’s how I love my hot cocoa. When I scrolled through the photos I just ooo’d and ahh’d these beauties. What a super fun idea, especially in the Winter! it’s always nice to have a good ‘healthier’ sweet recipe on hand! these sound great. I have a similar problem with the sweets in my house right now too. But all of mine are gluten-free, sugar-free, and vegan which means that most of them are fails, lol. Story of my life! These, however, look like a home run! 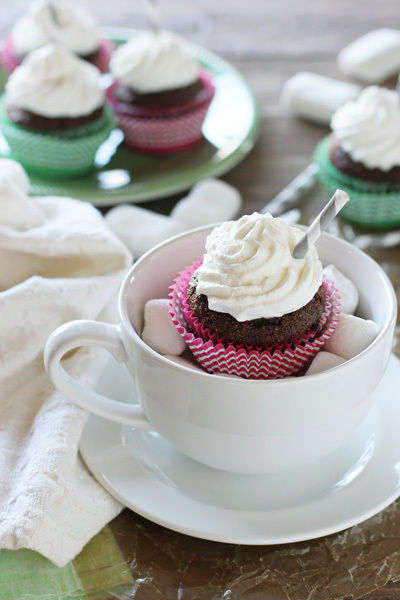 I can’t think of anything better than hot chocolate in cupcake form. Your mom and your sister are going to feel so spoiled! haha it can be so hard! That’s how most of my attempts turn out! So pretty girlfriend!! I CANNOT believe that this are healthy! They looks so decadent! OOh – I love a “sugar bonanza” specially one with honey and coconut oil! Double points that it’s gluten free too!!! I understand what you mean about the texture, but sometimes the flavor makes up for it – like these brilliant hot chocolate ones!! I always tell myself that calories don’t count around the holidays…makes sense, right?! 🙂 These cupcakes sound incredible, Ashley! I love the hot chocolate flavor. And your pictures are gorgeous, too! What a delicious dessert! Makes total sense!! And thank you! Thanks Laura! haha I like my food pretty too! Exactly! I love sitting down with some tea and a sweet treat at night!